The March Art Walk will be held March 3rd from 5:00 to 8:00 pm at the shops and galleries on Public Square, Franklin Street, and Strawberry Alley. The participating businesses are listed below as well as a description of the work they will be exhibiting and services they will be offering during the event. Edward’s Steakhouse is proud to feature local photographer, David Smith during the March First Thursday Art Walk. Edward’s Steakhouse will also be participating in UNITED WE DINE that evening. A percentage of their food sales that evening will go back to the United Way. Stop in, see the art, listen to Jackson Miller, live, on the piano and take in their Thursday night special, 1/2 priced $7.00 appetizers and 2 for 1 draft drink specials all while supporting the First Thursday Art Walk & the United Way! The Roxy Regional Theatre’s Peg Harvill Gallery is proud to feature the art of local artist, Peggy Bonnington during the March First Thursday Art Walk. Additional gallery hours are Monday through Friday, 9am – 2pm. For tickets to and information about our current production, THE CAT IN THE HAT, please visit www.roxyregionaltheatre.org or call the box office at 931.645.7699. The Downtown Artists Co-op is proud to host local artist, Billy Renkl during the March First Thursday Art Walk. Billy Renkl grew up in Birmingham, AL, and attended Auburn University and the University of South Carolina. He has taught drawing at Austin Peay State University in Clarksville, TN, for 26 years. Renkl’s collage work features fragments of old texts and diagrams, exploring the relationship that art has to information graphics, as well as the qualities inherent in paper ephemera. Billy Renkl’s exhibit is entitled Rock, Paper, Scissors, & Wood. Join us for the March First Thursday Art Walk and enjoy free admission! Trained as both an architect and as a sculptor, James Rodger Alexander utilizes form to articulate and delineate space. Both his large scale sculptural installations and small scale sculptural pieces focus primarily on one reoccurring issue: the resolution of the conflict between opposing forces. These opposing forces may be literal and physical or conceptual and philosophical. The recognition of dualities and the quest for a resolution is the consistent element in his work. James Rodger Alexander is currently Professor of Ceramics at Alabama State University at Birmingham. He earned his MFA in Sculpture and Ceramics from Louisiana State University, and also holds both the Bachelor of Architecture and Masters of Architecture in Urban Design degrees from Cornell University. What was it like to attend the Clarksville Female Academy? Items from our collection take a look at the schools and graduations of Montgomery County from the late 1860s to the 1930s. Photographs, diplomas, graduation dresses, and school related documents are on display to give insight into the lives of locals such as Carrie Wyatt and Mabel Ray Edmondson. Couture Crush is proud to support the March First Thursday Art Walk and host local artist Jane Olson. Jane’s art brings a fresh approach to watercolor pieces in a variety of sizes. Some of her favorite subjects are waterscapes, landscapes and floral compositions in the impressionistic and abstract styles. Couture Crush will stay open late and serve light refreshments. Its not too early to think about Spring, so stop in and find some new additions to your wardrobe during the March First Thursday Art Walk! The Framemaker proudly presents new work by artist Amy Dean. This exhibit is part of Clarksville’s First Thursday Art Walk on March 3, 2016. An opening reception will be held from 5 p.m. to 8 p.m. The exhibit will remain on display at the Framemaker throughout the month of March during normal business hours (Mon. through Fri. 10 a.m. – 5 p.m.). Amy Dean lives in Clarksville, Tenn., and and attends Austin Peay State University. Amy writes, “I am making work that responds to earlier, historically important, artwork. By studying and conversing with these artist, I find my own work is brought to life. In this critique I am exposing , them turning them inside out and allowing their story to mingle with mine”. Rogate’s Boutique will not feature an artist during the March First Thursday Art Walk, but will be open for business until 7pm. Stop in an find a a few new pieces to welcome Spring into your wardrobe! 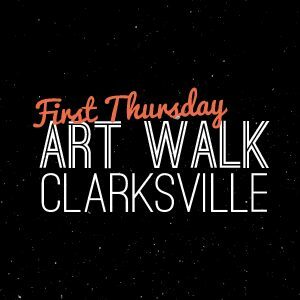 Hops Java & Juice is proud to support the March First Thursday Art Walk in Historic Downtown Clarksville. Stop in and enjoy the artwork displayed throughout the shop, pick up locally sourced products and food and grab a cup of coffee to keep you warm as you enjoy the March First Thursday Art Walk! Mildred and Mable’s will stay open late during the March First Thursday Art Walk.